I finally got the chance to make it. The wedding cake. I often see on different food blog multi-layered cake, more or less high of course but always to big for our stomacs with Adrien. And I have to confess we aren’t a big fan of sweet stuff, except sorbet of course. So to eat a cake weighting several kilos was not my plan. Sugar gum paste is quite weighty in fact. But I got lucky, two of our close friends were celebrating their wedding … and wait for it … They were asking some people to bring dessert to serve a large sweet buffet. I asked them if they were up to a wedding cake and yes they were so I began to look around to find all the things I needed. I have to admit that I like them a lot, I would never have done such a cake for anybody. This is not so difficult but you need a lot of time and to organise yourself. For those who live in Switzerland, I bought almost everything at “Le Royaume de Mélazic“. They also well advise me so my Pise tour will not fall apart before standing proudly on the wedding dessert buffet. That was the longest car journey of my entire life, the wedding cake on my knies, stoping to breeze at each turn. I almost fainted when we finally arrived. But thanks to our friends who drove us to the wedding reception, we arrived alive along with the cake. My prior plan to bring the cake using public transportation would have been a complete failure. At the end, we did it. However I needed at least 30 minutes to clear my brain. Then I could enjoy the party. Well done. Everything was great. Quality drinks and well enough. Amazing food. They hired an italian catering from Lausanne city. Some enormous parmesan cheese loaf were standing up on top of the buffet tables all along ! And we ate, we ate until we couldn’t anymore. We got back to our place straight after the party and we got to bed at … 8h30 … exhausted but happy ! You will find below a long recipe. I would advise you to manage to make it in 3 days so you aren’t too stress. 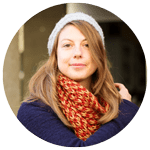 You will also find the links to the products and tools that I used to make it so you know what I am talking about. Beforehand, a dowel was for me a fish, a goudjon ??! Yes, that’s the same word in french for those two words. I bought everything at “Le Royaume de Mélazic” in Lausanne, Switzerland but I am sure you will find the same products near you. Put some maizena on top of the counter. 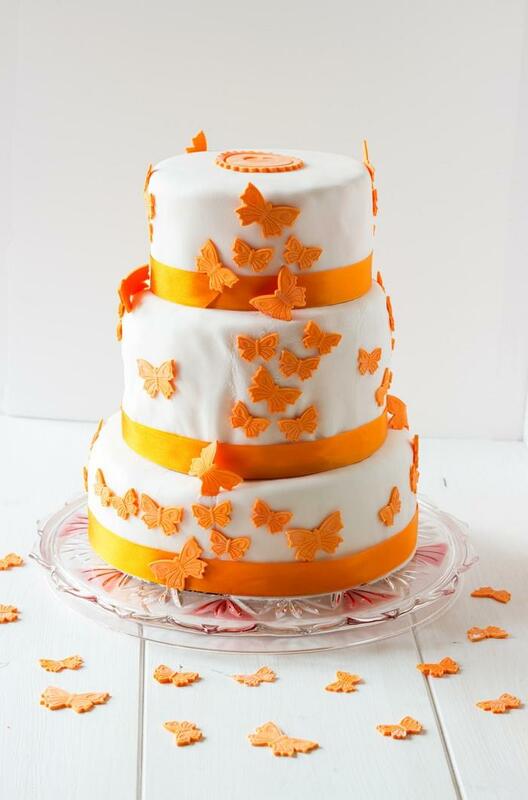 Roll down orange sugar paste and use butterfly moulds to make your butterfly. Leave to dry for 24 hours and then place in an airtight container. Preheat oven to 180°C. Mix flour, sugar, salt and baking powder. Reserve. Mix egg yolks with orange juice, grape seed oil and cointreau. Add preparation with flour and mix until you get a homogeneous paste. Whisk the egg whites until they form peaks. Incorporate to the previous preparation. Butter your 25 cm mold. Pour preparation and bake for 1 hour. Unmold and place on a cake rack. Bake an other cake using the 25 cm mould. Bake two of them using the 20 cm mould. For the last layer, half fill the 16 cm mold and reserve the rest for the last cake. Bake for 35 minutes and repete the operation. When all cake have cooled down. Wrap with some plastic foil and refrigerate. 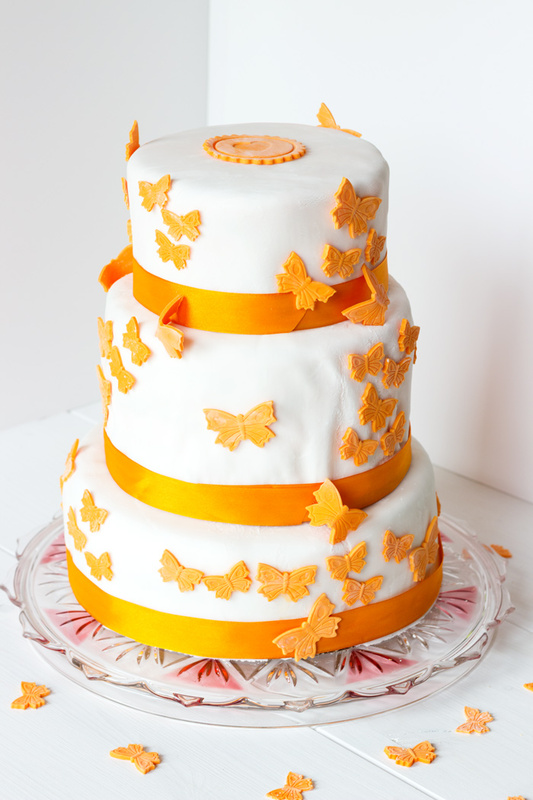 Make the buttercream mixing soft butter, powdered sugar, vanilla extract and orange coloring. 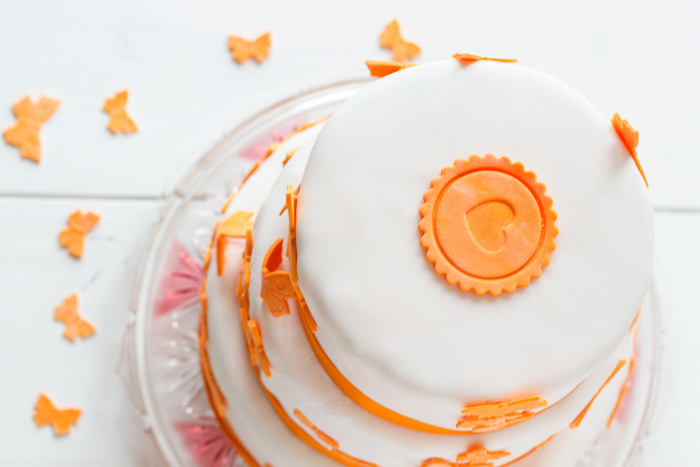 Cover the top of the first 25 cm cake with some buttercream and cover with the second 25 cm cake. Spread some buttercream on top and on the sides. Wrap again in plastic foil and place in the fridge for at least 1 hour before covering with sugar paste. Do the same with the others cakes. Reserve the buttercream leftover in your frige. Remove buttercream leftover from the fridge. Cut 3 cardboard circles, 25 cm, 20 cm and 16 cm. Spread some maizena on top of the counter. 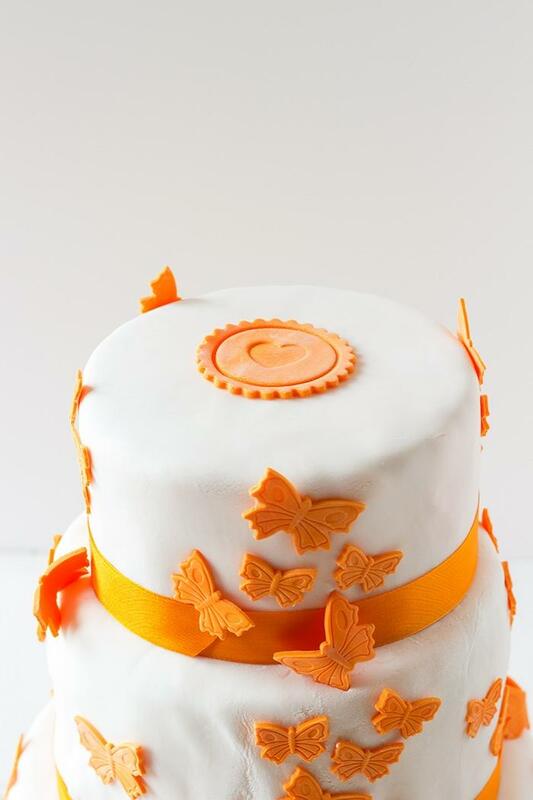 Roll down some sugar paste, enough to cover the 25 cm cake. To place on top of your cake do not use your hand but the rolling pin. Use then the sugarpaste smoother and cut around with a pizza wheel. Do the same thing with the two others cakes. For the structure of the wedding cake, take the 25 cm cake. Insert one plastic dowel, mark with a pen. Remove from the cake and cut 5 pieces. Place so they will support the weight of the 20cm cake. One in the middle and the four others around. Do the same with the 20 cm cake. Place the 20 cm cake on top of the 25 cm cake and the 16 cm cake on top of the 20 cm cake. 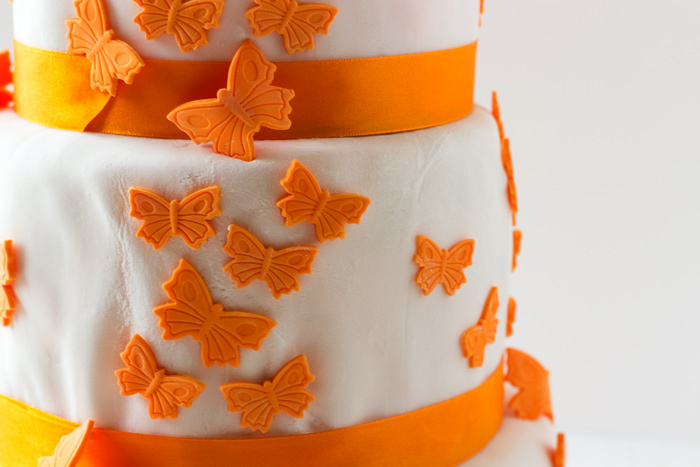 To hide the play between the cake, place some orange ribbons and finish with your butterfly using some food glue.